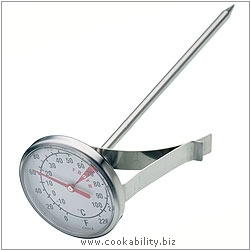 Stainless steel milk thermometer with easy to read dial. Temperature range -10 to 100°C or 0-220°F. Ideal frothing temperature outlined. Clips easily to side of a jug or saucepan.